Complete standalone system. Even if computer/network does not operate the entire system will continue without any interruption. Recorded Data will be sent to 4 emails every day / every week if required. Phone call & SMS will be made upto 10 operators and voice message indicating nature of fault will be delivered. a. 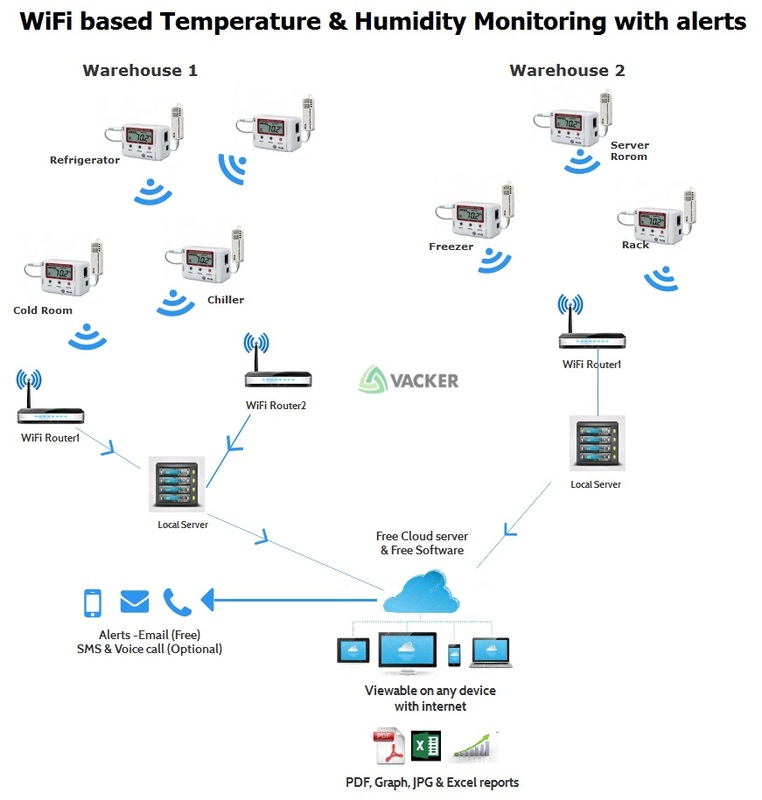 What is over temperature warning and alert System? the system continuously checks the temperature of the environment where it is installed. The frequency of collecting data can be programmed in the system which is called sampling interval. If temperature is recorded every 5 seconds, then the sampling interval is 5 seconds. For a critical storage system such as a medicine cold room (temperature between 2 to 8°C), the sampling interval can be kept as 1 minute. For a less critical system such as a warehouse (temperature between 2 to 8°C), the sampling interval can be kept as 10 minutes. 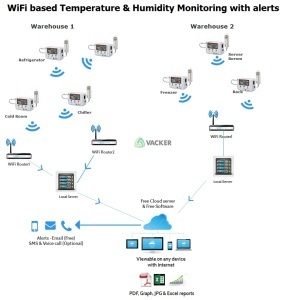 The alert system can be programmed for lower and higher level of temperature eg. for a medicine cold room (temperature between 2 to 8°C) a lower alarm level can be kept as 2.5°for 2 minutes and higher alarm level can be kept as 7.5° for 2 minutes. This means that if the temperature goes below 2.5°for 2 minutes or goes above 7.5°C for 2 minutes, an alarm condition will be generated. In this case different alerts such as a local strobe/beacon light, phone call & SMS to operators, Email to operators etc. will be generated as programmed. This video shows initial programming and subsequent modifications of the monitoring system for recording, alerts, data transmission etc.